Banjar Group — Insights on the World of Sales. Is the internet really to blame for loosing a 60 year old competitive advantage? Last week I had the pleasure of doing a Sales Cats keynote at the Albury Northside Chamber of Commerce. A wonderful group of business owners joined me and we spent a morning tossing around ideas of how to sell in tough times. There was however a sad start to the day. The night before on local Prime News, I noticed the story of Matthews Cycles in Albury closing after sixty years of trading due to the 'internet'. I was sad because this was not due to the internet. This business had tradition, clients, reputation for incredible service and most importantly it had a sixty year old brand. Unfortunately this 'brand' was painted on the outside of the business sixty years ago but had not been repainted/repurposed for the modern consumer. As this bulletin was read I jumped online and typed Matthews Cycles into my search engine. And guess what?! Nothing! No website. Plenty of secondary links that lead me to browse and buy elsewhere. While there is no doubt that service, and exceptional service at that, is critical to sales success today, the melding of web, social and online technology to your brand is critical. This wonderful icon of cycling in Albury should never have been lost. It should have been leveraged with innovation, tribe thinking, sixty years of selling data and branding that uses the internet as a new source of business not as a barrier. Look at this current study to understand the importance of blending a modern brand and the internet to build success. Should Matthews Cycles have had a Facebook page? This demonstrates that businesses can of course blame the internet for their downfall but at some stage they will have to take responsibility for shifting to new and innovative ways of selling to customers. The buggy whip maker made that shift when he discovered that driving gloves may be required for that dirty, smoking, noisy machine called the automobile as it rolled into to town. Why is customer service so hard in Australia? I've just spent four wonderful days celebrating a friends birthday which has given me an interesting perspective on what's possible in customer service given the right attitude. What started out as fun, gave an interesting perspective. "It's Mr Normie's birthday. Could you please help us celebrate by making a birthday wish?" Upon arrival at the outstanding Langham Hotel in Kowloon, we were greeted personally and given free Moët and cucumber sandwiches with a "Happy birthday Mr Normie smile" for three days! 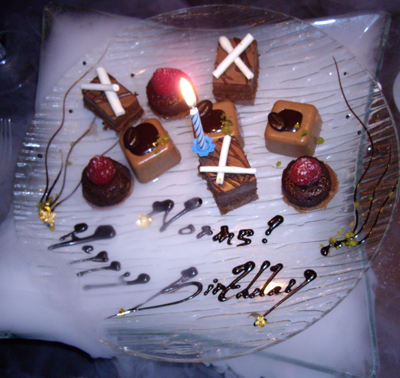 Normie's cake at Azuro Restaurant. We dined at the beautiful Azuro Restaurant where, with one simple request, the entire wait staff joined the celebration. They served a specially prepared dessert complete with dry ice to add to the theatre. All this with a "No problems for Mr Normie attitude." Even at a bar where the band was interrupted mid song, we got a "Put your hands up, put your hands up for Mr Normie”. Two hundred people screaming "Happy birthday Mr Normie!" Then on our way home with Singapore Airlines, following a whisper in the ear of a Singapore Girl, Mr Normie was sincerely presented with a handmade birthday card signed by all the cabin staff, a small cake, dry ice again and a glass of champagne. All in economy class! The best though was yet to come. My mate Norm rang the Langham Kowloon last night to thank the CEO of the hotel for their incredible service and staff. He left a message of thanks with reception. One hour ago the CEO rang Australia to wish Mr Normie a happy birthday. Did he have to? No of course not, but he did because he cares. The Singapore Girls did because they wanted to. The restaurant staff did because they love their jobs and are grateful for one. The Langham staff did because the standards they set themselves are high, and it works. We will go back. Sadly, our taxi driver coming home to Essendon from Tullamarine airport would not wish Mr Normie happy birthday because I did not ask. He was too pissed off about the small $37 fare for me to even mention it! It's not hard people. Happy birthday Mr Normie. Check out this brilliant video created by Ogilvy as part of a campaign to find the World's Greatest Salesperson. Maybe it's time, ladies and gents, to start paying closer attention to the creative wisdom of the younger generation. A loud applause please for having a detailed plan – backed up with 'the stats', keeping the issue simple and to-the-point, being pro-active and using enormous creativity to land the deal. Do you see the possibilities in that?